The International Floriculture Expo and United Fresh Produce Association will again collaborate for the 9th Annual Iron Designer Competition. The event will be held on Tuesday, June 21 on the expo floor at McCormick Place in Chicago, as part of three days of floral and produce industry events and education from June 20-22. This lively competition features leading floral designers from around the country in a challenge that will test their skills and creativity in front of a panel of expert judges and a cheering audience. Guided by the theme, “Still Life: Fusion of Produce and Floral,” designers race against the clock to choose from an array of fresh cut floral and fruits and vegetables and create an innovative display inspired by 17th and 18th century European still life paintings. 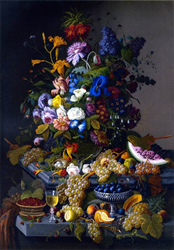 Still life paintings traditionally include very elaborate floral and produce elements, but competitors will be challenged to bring their creations into the modern day world of floral design. Last year’s winner was Joseph Lesczynski of Phillip’s Flowers in Chicago. He utilized items from floral companies Colour Republic, Syndicate Sales and Smithers Oasis, as well as produce commodities from Sunkist, WP Rawl, Bay Baby Produce, Apio, Inc, National Onion Association, and USA Pears.